Keep your bees fed throughout the year! Get a mason jar that has a solid lid. Poke several holes through the lid from the inside with a hammer and nail. Fill the jar with a syrup mixture and attach the lid. Drill a small hole in the top of the hive and set the jar upside-down over the hole so that the holes in the jar are all over the hole in the hive top. 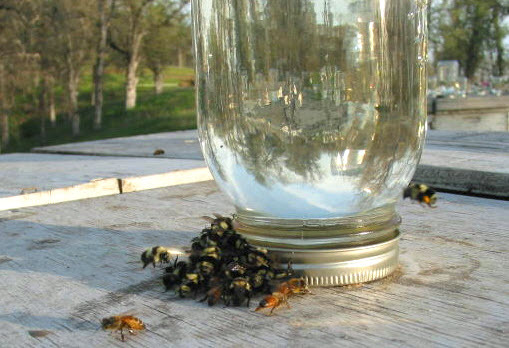 Keep a lookout for any gatherings of bees around the jar on the outside of the hive and replace that jar with one that does not leak if needed.